British company Excalibur Almaz (EA) has unveiled plans to take Joe Public on space flights to the Moon. Joe 'Minted' Public, that is, with tickets for the galactic missions to cost around £100 million each. EA says the commercial missions, set to blast off in 2015, will represent the first time man has been back to the Moon since Apollo 17 in 1972, although there'll be no opportunities for an actual moonwalk as the closest the capsule is likely to get to the cheese rock is 1000km. If you have £100 million burning a hole in your back pocket, don't think you'll be getting an easy ride of it – passengers will have tasks and chores to carry out aboard the spaceship while travelling and docked at one of two space stations, and the re-entry capsule that takes you from the docking space station to the moon and back is absolutely tiny. 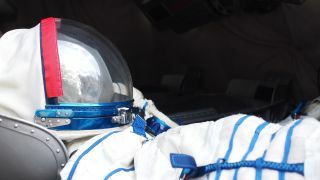 Techradar had a look inside the capsule this morning and we do not fancy spending multiple hours in the thing, although we would like a close-up of the moon. Luckily, we don't have £100 million going spare. "Excalibur Almaz is willing and able to send crewed missions deeper into space than would be possible aboard any other spacecraft in existence today," said Art Dula, CEO of EA, adding that it is the level of pressure involved that makes it all so tricky. "Our fleet of space stations and re-entry capsules enables us to safely fly members of the public to Moon orbit as early as 2015", he continued. "The EA fleet has previously flown to space several times and will undertake many more missions. It contains vessels of a design that has spent thousands of hours in space successfully. This, my fellow adventurers, is scientific fact – not fiction." If you'd like to check out the final-frontier hardware without shelling out the cash, EA will be showing off the re-entry capsule for free at Space Base London at the QEII Conference Centre on June 20. After that, you'll just have to start saving the pennies. The cash-strapped-but-still-incredibly-solvent among us may prefer to opt for the cheaper, shorter, less outer-space and more regular-space trip offered by Virgin Galactic instead. A space trip with Branson's buddies will set you back a bargainous £200,000.